(CNN) — Some of the details may change, but year in and year out, these destinations around the world have a well-deserved reputation for traditionally throwing a great New Year’s Eve shindig. A bonus for Sydney: Summer’s just started there, and you can also take advantage of the city’s beaches, including Manly, Bondi and Bronte. The dramatic skyline in Hong Kong provides a sight visitors never forget, and New Year’s Eve fireworks just up the ante. The fireworks that illuminate stunning Victoria Harbour are set to music. You might catch the dazzling display from one of Hong Kong’s many hotels with great views, including Hotel Icon and Park Lane. Crowds gather a couple of hours early at Star Ferry Pier (Tsim Sha Tsui) for some theater, dance and circus performances. While you’re in Hong Kong, you may also want to take in Ocean Park, a favorite amusement area. Bangkok often tops roundup lists of Asia’s best nightlife cities. So of course, it’s a natural place to ring in the new year if you like crowds, noise and revelry. Bangkok’s answer to Times Square, CentralWorld Plaza is one of the main gathering spots for celebrations. Another popular gathering spot is the Asiatique shopping and entertainment area along the Chao Phraya River. You may want to continue the celebration at one of Bangkok’s stunning bars such as Red Sky or a sky-high restaurant such as Sirocco. 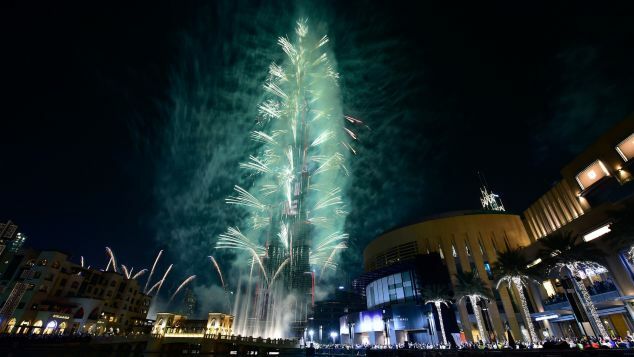 The Burj Khalifa in Dubai is one of the most attention-grabbing skyscrapers in the world, and it’s only more so at New Year’s Eve. Bringing in 2018, it holds the record for world’s tallest building (2,716.5 feet), and throngs gather at the footsteps to welcome a new year with an amazing fireworks show. Not too far away, Burj Plaza is a little quieter and popular with families. Dubai is building a reputation as a major food destination, so you may wish to indulge in top-tier restaurants such as Cavalli Club Dubai while you’re there. And if you have shopping in mind, check out Dubai Mall, one of the world’s largest. Historic Red Square in Moscow provides one of the coldest but also one of the most visually appealing settings for a New Year’s Eve fireworks display. If you want to celebrate in truly grand style with Russian flair, the Ritz-Carlton in Moscow may be for you. It’s centrally located and has a rooftop bar. While you’re there, you may want to see one of the world’s most visited tombs, that of communist leader Vladimir Lenin, or take a tour of Cold War relics from the Soviet era. Cape Town is one of the most beautifully situated cities in Africa — and the world. New Year’s Eve fireworks make it all the more spectacular. If you’re looking for a place with delicious food and a view of the festivities, check out MAReSOL, which specializes in Portuguese cuisine. If you’re in the mood for a party, Cape Point Vineyards is one of many places to consider. Make the most of your trip by visiting South Africa’s renowned vineyards around Cape Town. (Like Sydney, Cape Town is just entering summer). Stately London along the Thames always provides a remarkable backdrop for New Year’s Eve fireworks. 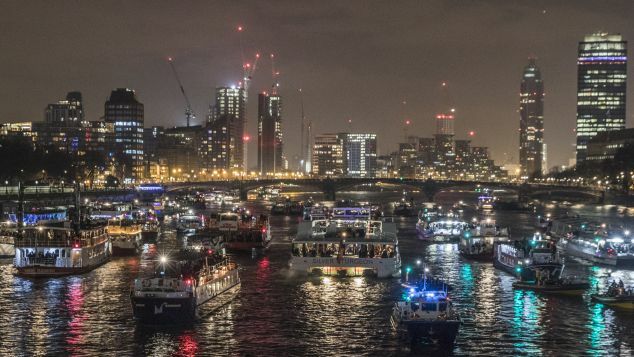 Tickets sell out fast for the official staging area, but you may be able to see the fireworks for free from hilltops such as Primrose Hill, Parliament Hill on Hampstead Heath, Greenwich Park and Alexandra Palace. A perfect way to greet the prospect of a new year is to settle down in one of London’s oldest pubs, such as the Old Bell Tavern, serving up adult beverages since 1670. If you’re looking for a more recent vintage of fun, check out the Southbank Centre’s themed parties from the 1920s to 1990s. If you want to party in classic Rio style, pay a visit to Jobi Bar. It’s a social institution in the city, having been open since the 1950s. For samba and choro music, head to Carioca da Gema. Times Square in Manhattan. It’s synonymous with New Year’s Eve across the United States. Even if you aren’t there in person, there’s a good chance you’ve watched the famous ball drop on television. (The ball made its debut in 1907 and has been dropped each year since then, except for two years during World War II). Queens: If you’re 21 or older, try your luck at Resorts World Casino, the only casino in the city. Near JFK Airport, it throws a blow-out NYE party. Vegas is bright lights year-round, but it goes all out for New Year’s Eve. If fireworks aren’t enough to entertain you, catch New Year’s Eve shows such as David Copperfield and Blue Man Group. Visitors are advised to book hotel rooms early, as prices in Vegas shoot up for the holiday. They’re also cautioned to dress warmly — the desert cools off a lot at night, especially in winter.